Heated hair styling tools such as blow dryers, curling irons, and straighteners, can add versatility to your look. However, the excessive or improper use of these tools can also lead to hair strand damage, split-ends, and premature hair loss. In order to get the beauty provided by heated styling tools without the worry of hair damage you need to know the do's and don'ts of using heat tools on your hair. Although specific do's and don'ts can change depending on which type of heated hair tool you are using, a few definite do's will always be the same. Do choose the heated styling tool that is right for your hair and level of usage. Fine hair will need less heat to style than coarse or thick hair so look for a tool with a large selection of temperatures. If you frequently use heated tools choose a more expensive model with a less damaging heating source such as ceramic plating or steam. Do clean your tools regularly to remove product build up and excess hair oil. The build up and dirt can interfere with the proper function of your heated tools resulting in more hair damage and less than stellar styling results. Do apply a heat protective styling agent to your hair before using heated tools. Heat-activated styling products- such as leave-in conditioners, sprays, gels, and balms- will coat the hair strands to protect them from direct heat and add flexibility to the hair to eliminate snags and breakage. Do deep condition your hair once every one to two weeks to put back the moisture, softness, and shine that heated tools can rob from your hair. Don't rest a heated tool over one section of hair for too long. When using heated styling tools make sure that the heat source is never left in direct contact with any one section of hair for longer than 15 seconds. Too much heat for a prolonged period of time can weaken the hair strand and result in split-ends, strand breakage, and even premature hair loss. Don't apply to heat directly to the hair roots. The roots of your hair are very vulnerable to damage. Direct heat can burn the root or hair follicles resulting in slow hair growth or strand breakage. Don't use multiple heated hair tools everyday. Since any heat source can be damaging to your hair you need to limit the total exposure time each week. If you must use a blow dryer and a curling iron every day, give your hair a break every five days and avoid the use of all heated tools for at least 24 hours. Don't aggressively style your hair while using a heated tool. 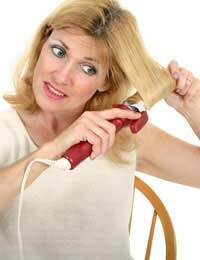 Heat expands the hair strand making it weaker and more susceptible to damage. Avoid brisk brushing, tugging at tangles, ratting, and pulling hair strands while styling with heat. Don't ever use a heated tool that is only meant for dry hair on wet or damp hair. Some heat sources, like the barrel of a curling iron, will steam the moisture out of the hair strands, which could lead to skin burns or strand damage. By following the suggested do's and don'ts of heat styling you can get the look you want day after day without sacrificing the health of your hair.